Compact kitchen trolley with varnished hevea worktop, two pull-out drawers, hand rail/towel rail, built in wine rack with a capacity for four bottles and two built in slatted storage shelves. It stands on four wheels, two of which are lockable, its size is 54 by 38 by 84½ cm high (21¼ by 15 by 33¼ inches approx) and it is made from eco-friendly hevea hardwood. 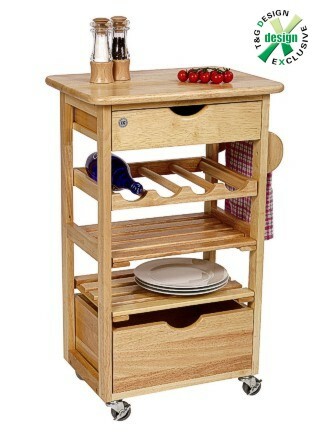 This trolley is delivered to your door flat packed and is easily assembled.